vacationrentalsexperts.pennistonemedia.com/egypt-a-land-w... - ASWAN This is Egypt’s third largest city located at the foot of the Nile near Lake Nasser. It is known for its local holiday shopping and fresh spices. Many cruise boats bring in visitors to stop over for a while. The city is filled with temples and monasteries to visit. 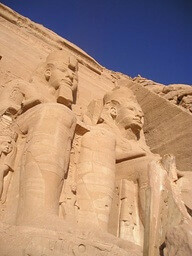 Abu Simbel- It consists of two rock-cut temples built by Ramesses II in honor of himself during 1290-1223 BC. When the Aswan Dam was being built in 1960’s , many countries of UNESCO collectively helped save the temple from drowning in the waters of lake Nasser by breaking the parts and bringing it up 65 meters to a higher ground and reconstructing the entire temple, piece by piece to restore it to its original glory. It took 4 years to complete the rescue operation! Other attractions include the Nubian Museum and the Unfinished Obelisk which was abandoned due to some flaws during the reign of Queen Hatshepsut. It would have been the heaviest obelisk of Ancient Egypt, had it been completed.